Originally born in the heart of the Gemstone State, USA, Jian London moved to the UK in 2008. In 2011 the brand won the Editor's Choice innovation award for Technical Excellence at International Jewellery London, the UK's top jewellery show. 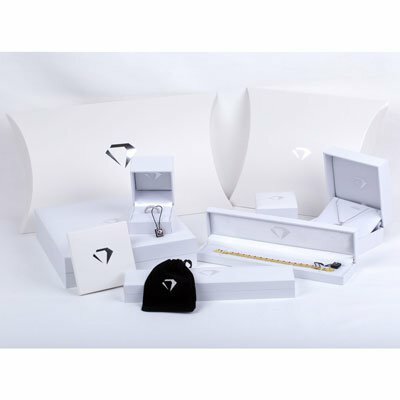 The brand designs, manufactures and retails its own jewellery with each item available in Silver, Gold and Diamond pricing making fine Jewellery affordable for everyone. In addition Jian London currently retails exclusively online providing exceptional service and value, with most items positioned at roughly 50% of High Street prices for an equivalent item. We source gemstones from all around the world selecting only those that meet our strict requirements to include in our collections. Our designs combine these in creative ways for people to choose their own personal look and style whatever the occasion. 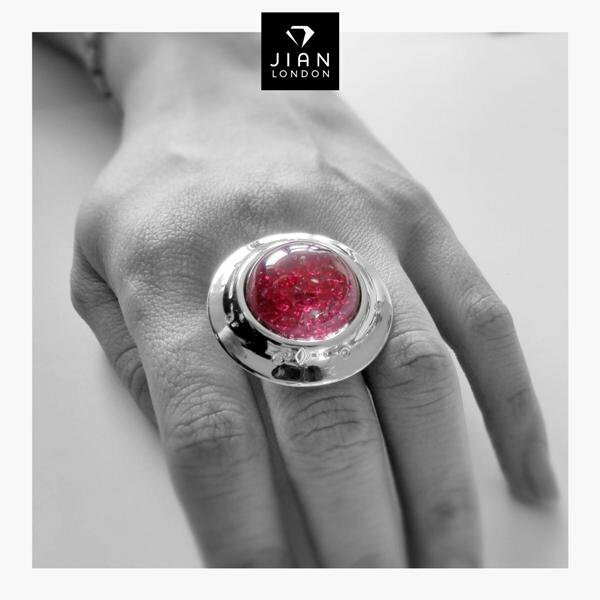 Jian London is committed to providing each customer with the highest standard of product and customer service. All of our products come with a one year guarantee plus a 30 days returns policy. We are a member of the National Association of Jewellers, designed to provide consumers confidence to purchase from it's members through a Code of Practice setting the highest standards of professionalism, honesty and ethical business practices. Glasgow, G11 6BL, United Kingdom. South Plainfield, NJ, 07080-1307, USA. Gouaux de Larboust, 31110, France. Whichever shipping method you choose they are tracked and require a signature. If you cannot be there then you can choose an alternative address or your work address if your credit or debit card company approves this. We know receiving a gift or sizing can sometimes be an issue so we offer a free exchange within 30 days or for gift items within 45 days. If you would like to exchange your purchase, please contact us at sales@jianlondon.com, alternatively you can call on +44 (0) 20 3287 8088. Exchange items can only be dispatched after the returned goods have been received. Orders between 1st November and 31st December can be returned up to 31st January the following year provided they are still in their original condition and the security tag has not been removed. If for any reason you are not satisfied, you may return any item in its original condition within 30 days of the date of shipment for a refund or exchange. If you have questions about our return procedure, please do not hesitate to contact us. 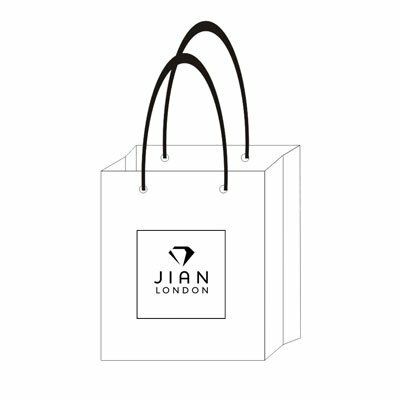 To return your purchase to Jian London please email or call 020 3287 8088 to receive a Returns Authorisation Number as well as detailed instructions for returning your order. Call or email before returning items. Return all items in their original packaging unless it is for exchange. Returns or exchanges must be in their original condition and items showing signs of wear, altered, resized or damaged cannot be accepted for return or exchange. Pierced jewellery is none returnable if it has been worn. Bespoke, made to order, altered or made to measure jewellery is none returnable. Once we have received your return your refund or exchange will be processed by the following day. Every Jian London order arrives in our beautiful signature packaging, designed exclusively by us. 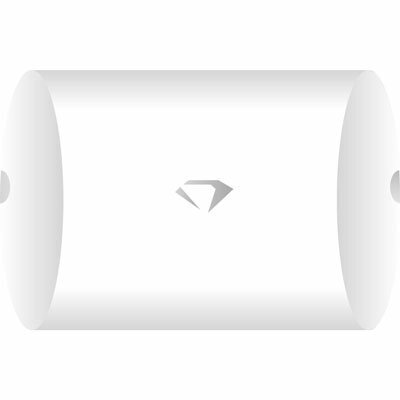 The iconic diamond symbol is an indication of the luxury piece that awaits inside plus it makes a wonderful way to store your piece. If you'd like to add a personal message to a gift order, please contact us and we'll include it in the package on your behalf. 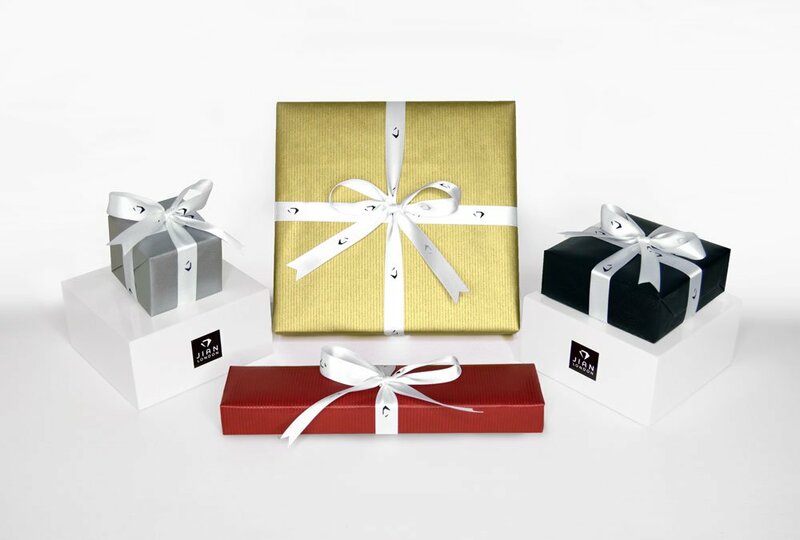 Choose from three luxury gift wrap paper. All jewellery should be treated with a lot of tender loving care to keep it looking at its best. All precious metals can suffer scratches and dents when it comes into contact with harder elements. It is recommended that rings aren't worn when carrying out heavy chores, sports and other activities where it might come in to contact with hard surfaces or be exposed to chemicals. 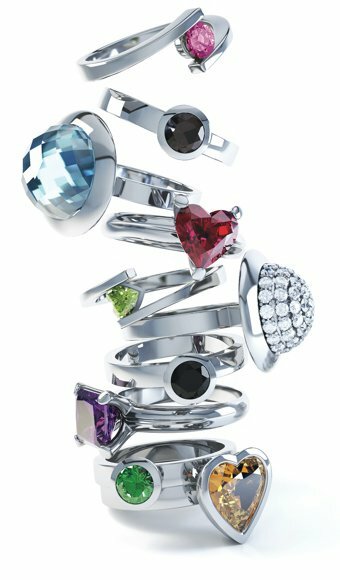 As with most types of jewellery contact with chlorinated water can attack the surface and result in damage to its appearance over time. To maintain the finish and shine, it's best to remove your jewellery when you go swimming and avoid contact with everyday items such as perfume, hair-spray and cleaning products. Many of our jewellery items are enhanced with Rhodium plating, giving a highly reflective white surface. It is perfectly normal that over time, this surface may lose some brightness, especially on rings that are worn all the time every day. To bring back that brand new look a Rhodium replating and polishing service is available. Sapphire is the 2nd hardest gemstone after diamond and is resistant to most small everyday scratches and bumps. However it is recommended to avoid wearing other diamond rings in a position where they can come into contact with the sapphire dome. Exposure to direct sunlight will quickly heat the dome and liquid inside due to it's shape and optical nature and it's best to avoid wearing it while sunbathing or leaving it directly exposed to sunlight. It is normal for the tiny bubble to shrink or grow slightly due to differences in temperature. The clasp tongue is a doubled over base metal spring tongue for durability and reliability. When inserted, to join the ends together, it will “click” into place. The safety clasp(s) can then be set. New clasps can sometimes be a little stiff. Get used to the feel of the clasp by trying it a few times. On the Round cut style, depress the last gemstone next to the tongue and gently pull apart. On the Princess cut style, depress the square button next to the tongue and gently pull apart. Overtime clasps can become slightly loose however they can easily be adjusted to either tighten or loosen them. To make the clasp TIGHTER, very gently lift the top side of the tongue, using the release button or mechanism. This will open the gap in the spring a little making it tighter to insert. To make the clasp LOOSER, squeeze the release button or mechanism, and the bottom of the tongue together. This will close the gap in the spring, making it a little looser and easier to insert. We are delighted to offer a bespoke jewellery service and are able to customize any of our existing jewellery or create whatever you may be looking for… from an engagement ring, to earrings and pendants, as well as more elaborate pieces. With choice of Mozambique Garnets. Hi Jane, I have the ring and it's absolutely stunning!! It exceeds my expectations and is a real showstopper!! Going big and red was definitely the right choice. The shape of the bezel is perfect and it looks just like a spaceship. I love watching the garnets fall during long meetings, very calming. Thank you again!! I really love it!! Bring back your jewellery’s sparkle and shine. Over time most items will receive scratches, bumps or get broken. If you have an item of jewellery that needs cleaned, polished, re-plated or repaired then just pop the item into the pouch and box provided, along with a note of what is required, and send it to us in a small padded envelope using the label provided via 1st class recorded delivery or Special Delivery for more expensive items. Knotting helps prevent pearls rubbing together and from coming loose alltogether. Access our vast range of natural and created gemstones to match, replace, renew, refurbish or enhance an older or broken item of jewellery. Use these prices to guide you through our repair services. Basic jobs will only require the one service however some jobs might require a combination of services but we will always contact you to confirm before commencing any work. Prices include 20% VAT but exclude delivery. During checkout your order details will be passed securely to our preferred processing partner Paypal where all of the major Credit and Debit Cards are accepted. For the exhaustive list of cookies we collect see the Cookie Section. Handling your orders and payments, Financial record keeping. Provide recommended features, products, promotions or special offers, or other information which we think you may find interesting using the email address which you have provided. From time to time, we may also use your information to contact you to provide customer services, product information, or market research purposes. We may contact you by email, phone, fax or mail and to help provide a more personal experience on our websites. if you have previously agreed to us using your personal information for direct marketing purposes, you may change your mind at any time by writing to or emailing us at sales@jianlondon.com or clicking the unsubscribe link at the bottom of the page. You may request details of personal information which we hold about you. If you would like a copy of the information held on you please send an email to: sales@jianlondon.com.